The folks at Sesame Workshop have struck gold once again. They have teamed up with Encore Software and released a new learning program based on some of the muppet characters from Sesame Street. This new programs is called Sesame Street Monster Clubhouse. 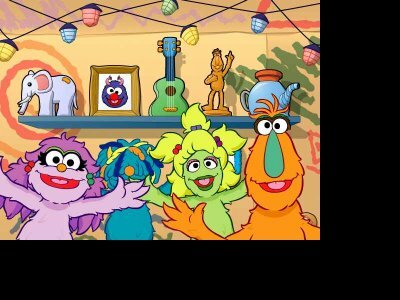 It features monsters like Phoebe, Mel and Googel from the Sesame Street television show. There are a lot of fun activities in amongst the things that are being learned. Make some original music or make a funny face in a Mr. Potato Head style of game. To enter the Monster Clubhouse you should have a Membership Card. Sign in to obtain one. Then anytime after that when you want to enter the clubhouse, simply click on the Membership Card icon on the wall next to the door. You will be allowed in. Actually, you can get into the clubhouse without a Membership Card, but it is better to have one. This program is designed for children ages 2 to 5 years old. There are 15 preschool skills that are being taught throughout the program. These skills include sequencing, rhyming, shape identification, pattern recognition and numbers. There is also color recognition, matching, classification, labeling emotions and visual discrimination. Some of the activities include a rhyming game with Elephant. A drum on the left side of the screen will have two words on it. The drum on the right will have pictures of three different things. You will have to math the right picture that will rhyme with the words on the left drum. There are also dance lessons that you can help with to make Mel dance just like Narf. And who doesn’t get hungry? Monsters most certainly do. Help Narf make snacks by putting the right sized snack into the machine. Follow the instructions that Narf gives you and there will be a delicious snack waiting for your. This program can be used on a slightly older machine. The requirements only call for a Pentium 266 PC with 64 MB of RAM. You will need less than 50 MB of free hard drive space and an 8X CD-ROM drive. If you want a fun learning program for your child, and the like Sesame Street, then Monster Clubhouse is really a title that you should pick up. It has a lot of learning activities from a group of people who have been in the fun learning business for a long time. Look for Sesame Street Monster Clubhouse at retailers like Target and Toys R Us. You might also want to visit the Encore Software web site. It can be found at www.encoresoftware.com.